As artificial intelligence creeps out of data labs and into the real world, we find ourselves in an era of AI-driven decision-making. Whether it’s an HR system helping us sort through hundreds of job applications or an algorithm that assesses the likelihood of a criminal becoming a recidivist, these applications are helping shape our future. AI-based systems are more accessible than ever before. And with its growing availability throughout industries, further questions arise surrounding fairness and how it is ensured throughout these systems. Understanding how to avoid and detect bias in AI models is a crucial research topic, and increasingly important as its presence continuously expands to new sectors. AI builds upon the data it is fed. While AI can often be relied upon to improve human decision-making, it can also inadvertently accentuate and bolster human biases. What is AI bias? AI bias occurs when a model reflects implicit human prejudice against areas of race, gender, ideology and other characteristic biases. Google’s ‘Machine Learning and Human Bias’ video provides a tangible example of this idea. Picture a shoe. Your idea of a shoe may be very different from another person’s idea of a shoe (you might imagine a sports shoe whereas someone else might imagine a dressy shoe). Now imagine if you teach a computer to recognize a shoe, you might teach it your idea of a shoe, exposing it to your own bias. This is comparable to the danger of a single story. So, what happens when we provide AI applications with data that is embedded with human biases? If our data is biased, our model will replicate those unfair judgements. Hiring automation tools: AI is often used to support HR teams by analyzing job applications and some tools rate candidates through observing patterns in past successful applications. Where bias has appeared is when these automation tools have recommended male candidates over female, learning from the lack of female presence. Risk assessment algorithms: courts across America are using algorithms to assess the likelihood of a criminal re-offending. Researchers have pointed out the inaccuracy of some of these systems, finding biases against different races where black defendants were often predicted to be at a higher risk at re-offending then others. Online social chatbots: several social media chatbots built to learn language patterns, have been removed and discontinued after the posting of inappropriate comments. These chatbots, built using Natural Language Processing (NLP) and Machine Learning, learned from interactions with trolls and couldn’t filter through indecent language. The three scenarios above illustrate AI’s potential to be biased against groups of people. And the key underlining factor of these results is biased data. Although inadvertently, they did exactly what they were trained to do — they made sense of the data they were given. Data reflects social and historical processes and can easily operate to the disadvantage of certain groups. When trained with such data AI can reproduce, reinforce, and most likely exacerbate living biases. As we move into an era of AI-driven decision-making, it is more and more crucial to understand the biases that exist and take preventive measures to avoid discriminatory patterns. Interaction bias: when systems learn biases from the users driving the interaction. For example, chatbots, when they are taught to recognize language patterns through continued interactions. Latent bias: When data contains implicit biases against race, sexuality, gender etc. For example, risk assessment algorithms which show examples of race discrimination. Selection bias: When the data you use to train the algorithm is over-represented by one population. For example, where men are over-represented in past job applications and the hiring automation tool learns from this. So how can we become more aware of these biases in data? In Machine Learning literature, ‘fairness’ is defined as “A practitioner guaranteeing fairness of a learned classifier, in the sense that it makes positive predications on different subgroups at certain rates.” Fairness can be defined in many ways, depending on the given problem. And identifying the criteria behind fairness requires social, political, cultural, historical and many other tradeoffs. Let’s look at understanding the fairness of defining a group to certain classifications. For example, is it fair to rate different groups loan eligibility even if they show different rates of payback? Or is it fair to give them loans comparable to their payback rates? Even a scenario like this, people might disagree as to what is fair or unfair. Understanding fairness is a challenge and even with a rigorous process in place, it’s impossible to guarantee. And, for that reason, it is imperative to measure bias and, consequently, fairness. Strategies of measuring bias are present across all society sectors, in cinema for example the Bechdel test assesses whether movies contain a gender bias. Similarly, in AI, means of measuring bias have started to arise. Aequitas, AI Fairness 360, Fairness Comparison and Fairness Measures, to name a few, are resources data scientists can leverage to analyze and guarantee fairness. Aequitas, for example, facilitates auditing for fairness, helping data scientists and policymakers make informed and more equitable decisions. Data scientists can use these resources to evaluate fairness and help make their predications more transparent. The Equity Evaluation Corpus (EEC) is a good example of a resource that allows Data Scientists to automatically assess fairness in an AI system. This dataset, which contains over 8,000 English sentences, was specifically crafted to tease out biases towards certain races and genders. The dataset was used to automatically assess 219 NLP systems for predicting sentiment and emotion intensity. And interestingly, they found more than 75% of the systems they analyzed were predicting higher intensity scores to a specific gender or race. As AI adoption increases rapidly across industries, there is a growing concern about fairness and how human biases and prejudices are incorporated into these applications. And as we’ve shown here, this is a crucial topic that is receiving more and more traction in both scientific Literature and across industries. And understanding the human biases that percolate into our AI systems is vital to ensuring positive change in the coming years. Ahead of us is a significant change in the way brands use customer experience (CX). We are already starting to see the switch from companies competing on price and product to competing on CX. But what exactly do we mean by CX? Gartner defines CX as a customer’s perceptions and feelings caused by the one-off and cumulative effect of interactions with a supplier’s employees, systems, channels or products. Previously, the communication flow between customers and companies was either in person, writing or via a telephone call to the support line. Now, there are increasingly more ways customers can interact with brands, and when they do, they expect a high-quality experience “on demand.” 81% of marketing leaders were expected to mostly or completely compete based on customer experience by 2019, as revealed in the 2017 Gartner Customer Experience in Marketing Survey. There are many tools already giving insight to CX, such as NPS and Customer Success Scores. However, when companies need to make quick decisions, real-time insights are what’s helping decision makers. Technologies such as AI are now gathering these insights by allowing companies to organize and categorize data based on business needs, helping to make sense of all these interactions. Speech Analytics: understanding, interpreting and analyzing voice conversations. Example: understand sentiment, IVR systems. Image: capturing, processing and analyzing images, photos and video. Example: customer patterns, social media image analysis. Natural Language Processing: analyzing human expression and emotion. Example: text, chatbot, email analysis. Are data scientists the only ones needing to understand these technologies? No, it’s extremely valuable to both marketing and CX teams to gain an understanding of these tools. Every company has unique needs depending on CX goals and business objectives. Teams need to make a well-informed decision and understand which tools are most useful to their business, which will essentially lead to more accurate decision-making and a customer-first approach. Now, are people rushing to adopt these new AI technologies for CX? In Gartner´s 2018 Enterprise AI survey, it was revealed that businesses that are already deploying AI, 26% are implementing it to improve customer experience. Although it may not seem urgent to start implementing these technologies right away, it’s important that businesses are aware and start to familiarize themselves with these AI applications. A good place to start is mapping out a customer journey and finding the ‘dark spots’. These are the areas that could benefit from deeper real-time insights, such as understanding the mood of a customer when they are talking with a chatbot. Having these insights will allow you to hand over the conversation to a human based on the customer’s emotion. Companies are dealing with an increasing number of interactions happening across multiple channels and devices. With customer expectations are at an all-time high, it’s not easy to connect all these touch points and deliver an excellent customer. AI can help provide rich insights allowing you to get faster, real-time understandings, and optimize the overall customer journey. Mobile World Congress (MWC) 2019, the world’s largest exhibition for the mobile industry, welcomed leaders from mobile operators, device manufacturers, technology providers, vendors and more. This year’s event saw a focus on two core concepts: 5G and Artificial Intelligence. It was said to be one of the most important events in recent times for the mobile industry. In the days leading up to the show, a warm buzz of anticipation filled the air as attendees were eager to hear about the new groundbreaking technologies. We were excited to be surrounded by leaders in the field and pleased to be a co-exhibitor for the Washington State Delegation of Commerce. With a large number of keynote presentations, panel discussion and exhibitors, there were many outtakes from the event. A hot topic that continued to emerge was AI bias. On day two I was able to discuss this topic with other like-minded people: Elena Fersman (Ericsson), Beena Ammanath (HPE), Beth Smith (IBM) and Kriti Sharma (Sage), who are all working towards an unbiased future for AI. We discussed ‘Democratizing AI and Attacking Algorithmic Bias’. The discussion of bias in AI continued throughout the event as many people came to speak with us about how to overcome this problem. If you missed this talk and want to hear more, see an edited version here. We also attended the Applied AI Forum: an exclusive conference that brought together telecom leaders, AI specialists, start-ups and academics, with an aim to spur debate and discussion on the practice of AI across the digital economy. Google and IBM Watson held an interesting panel discussion that explored ‘Applied AI: new trends and strategies’. In this forum, we were able to share lessons learned and discuss recent breakthroughs with both data scientists and global leads from several large enterprise companies. Another key highlight of MWC was our exciting hiring announcement! On the second day, we released our plans for the year: to double the size of our company by the end of 2019. With the rapid growth of AI applications seen across all industries, there is an increasing demand for high-quality data. And with this, our company is growing faster than ever. We are looking for more talent to join our team in Portugal, Japan, and the United States. See our careers page for more information. What a big week it was as we move into a new era of Intelligent Connectivity. A huge thanks to GSMA, a body representing the interests of mobile networks globally, and everyone we met at the event. We’d love to continue the discussions we had, especially around the topic on bias in AI. Reach out at pr@definedcrowd.com, we’d be glad to hear from you. We are already thinking about what next year might hold. We’re in a huge growth stage and are looking for talent to join our global team in Portugal, Japan, and the United States. Check out our careers page for current openings. We accelerate the evolution of Artificial Intelligence initiatives by delivering high-quality training data to enterprise companies. We are investing heavily in our business and the people to make this happen. Over the coming months, we’ll be searching for professionals who are looking to embark on an exciting career while making a difference in AI. So, who are we? We’re an 80-employee startup based in Seattle, with offices in Lisbon, Porto, and Tokyo. Our CEO, Daniela Braga founded DefinedCrowd in 2015 to fill a gap in the market by offering high-quality training data to help machine learning products reach the market at optimal quality and speed. And with the rapid growth of AI applications and the high demand for this data, our business is growing so quickly that we are looking to nearly double our team by the end of 2019. We are currently hiring positions in the following departments: Development, Product, Marketing, and Operations, with several openings for Software Developers (Frontend, Backend, and Full Stack), QA Automation Engineers, and Machine Learning Engineers. These positions are available within our four offices and will have an important role in the expansion of the company’s product: an all-in-one data platform. Earlier this year, DefinedCrowd was selected as one of CB Insights top 100 AI startups. Our client list includes many Fortune 500 companies including BMW, Mastercard, Nuance, and Yahoo Japan. We also have partnerships with IBM, Microsoft, and Amazon. For anyone interested, make sure you keep an eye out on our careers page http://careers.definedcrowd.com, where there will be new jobs added throughout the year. It´s not easy to project trends in a market evolving as rapidly as AI. However, through analysis of cross-industry data and experience with a diverse client-base, we’re willing to make some bets. From automating mundane daily tasks to leveraging computer vision for more accurate medical diagnoses, here are 5 trends in AI we expect to emerge in 2019. Edge AI refers to processing AI algorithms locally instead of relying on cloud services or data centers. Smartphones, cars, and wearable devices are examples of devices that need to make faster and more accurate real-time decisions. Autonomous vehicles, for instance, need to make hundreds of decisions per second – brake, accelerate, turn on lights, identify and interpret traffic patterns, signals, and speed limits – all while simultaneously responding to the driver’s voice commands. These decisions must take place in a fraction of a second, and they need to be independent of the connectivity issues that come with cloud computing. This means that autonomous vehicles need powerful chips to process all this information rapidly and accurately. Tech leaders like Nvidia, Qualcomm, Apple, AMD, and ARM are investing in developing and delivering chips that can handle these kinds of workloads. In 2019 we’ll see more models being deployed at the edge as well as specialized chips allowing AI models to operate independently from the centralized cloud, or on the “edge” if you prefer. Last year the FDA (U.S. Food and Drug Administration) approved IDx-DR, an AI-enabled software that can independently diagnose diabetic retinopathy before severe complications (such as blindness) emerge. The FDA also cleared Dip.io, a product developed by startup Healthy.io, as a class II medical device. This diagnostic tool can monitor urinary tract infections and track pregnancy-related complications by analyzing photos of dipstick urine tests. It’s as simple as uploading a photo, the model takes it from there. 2019 will be a remarkable year for AI in healthcare. Equipment failure is one of the main causes of production downtime, a huge line-item for any asset-intensive business. However, today maintenance teams spend 80% of their time collecting data but only 20% analyzing it. Factory and field equipment generate mountains of unleveraged data that could go a long way to solving these issues. Alongside cameras and sensors, ML-driven algorithms can learn to check assets’ “vital signs,” catch small irregularities (a loose screw) before they turn into larger ones (a damaged turbine) and provide productivity predictions, allowing firms to plan accordingly. With sensors becoming more affordable, and edge computing gaining momentum, machine learning will become even more heavily incorporated in industrial processes in 2019. We say conversational AI, what pops into your head? If it’s chatbots, you’re not alone. While that’s certainly a huge part, the technology is much broader as it is integrated across messaging apps and voice-enabled virtual assistants who go far beyond the scope of chatbots. In 2019 we can expect to see even more AI deployed to handle routine customer service interactions. Whether you’re booking a flight, searching for a new restaurant or requesting the arrival date of your next purchase, AI can assist you. Research from eMarketer shows that this year 66.6 million Americans are expected to use speech or voice recognition technology. Banking and retail are great examples of industries already using conversational AI initiatives, and as the technology continues to mature in 2019, we expect to see even more use cases in even more industries. According to McKinsey, RPA will have an economic impact of around $6.7 trillion by 2025. Forrester Research also mentioned that RPA market is estimated to grow to $2.1 billion by 2021. Although RPA is not considered AI – since it’s rule-based and can’t learn anything on its own – there’s been a collaboration between RPA and AI. Due to its capacity of automating repetitive and time-consuming tasks, RPA can save employees tons of time, at the same time it can ensure processes are running smoothly and precisely. On the other hand, AI can enhance RPA. For instance, take a bank that’s onboarding a new client and needs to adhere to Know Your Customer/Anti Money Laundering Compliance Regulation. RPA is great for doing a lot of manual work. What AI can do is analyze the data the RPA’s pull in a more sophisticated manner, and arm a Compliance officer with more useful information. Whether there is a need to automate processes or implement solutions in this field, RPA has been mainly leveraged by large companies – until now. In 2019 we can expect to see small and medium-size businesses starting to adopt RPA, due to its clear benefits and increased popularity. We’ve come a long way since forming in 2015. Starting out as a small team, we now have four offices worldwide – Lisbon, Porto, Tokyo, and Seattle – and continue to grow every day. Our unique platform has helped many successful companies feed their artificial intelligence applications with training data. Using human intelligence coupled with machine-learning, we deliver project-specific, quality-guaranteed data. 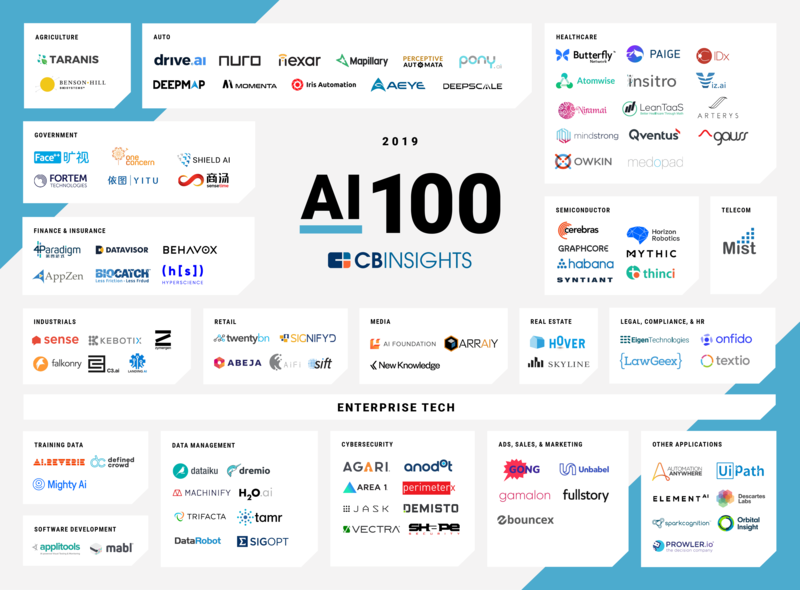 Today, we’re proud to announce that DefinedCrowd is among CB Insights’ third annual list of 100 AI startups. A research team from CB Insights selected 100 startups based on the following factors: investor profile, market potential, partnerships, competitive landscape, and team strength. Companies are categorized by focus area. These focus areas aren’t mutually exclusive and include core sectors such as telecommunications, government, retail, healthcare and enterprise tech sectors such as training data (where we sit), software development, data management, and cybersecurity. We are pleased to be among this group of incredible AI startups, selected from an extensive list of 3k+ AI companies, and look forward to seeing these companies grow. It´s been a great start to 2019. And, we´re very thankful to everyone who has helped get us here. DefinedCrowd Blog Blog at WordPress.com.